Brilliantly renovated, 5.1 bedroom, feature-packed home in an enchanting, wooded setting. This is the home your large or extended family has been waiting for. No compromises in features or style to get the space you need. The unique and versatile layout provides 2 bedrooms on the main level, a full bathroom for every bedroom, and a great room that more than lives up to its name. The nearly half acre, wooded lot is tucked away at the end of a quiet cul-de-sac. The outdoor kitchen is the stuff dreams are made of. It all starts with the curb appeal. Organically shaped circular drive, charming front porch against a backdrop of stone and cedar shingles, quietly set back from the road. 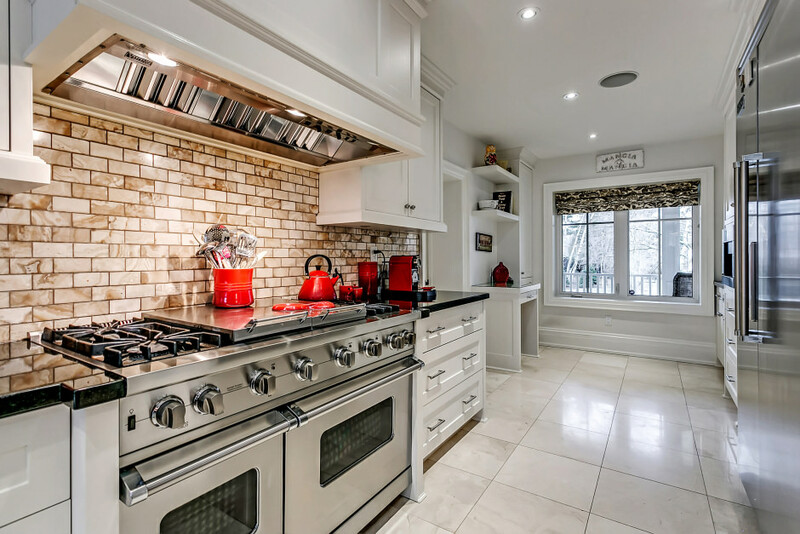 The main level offers a fabulous, family-friendly, open concept Misani kitchen complete with top-of-the-line appliances (including 2 full-sized dishwashers), and breakfast bar with seating for 6. The kitchen is open to the great room, where the ceiling vaults to nearly 18 feet, the stone surrounding the fireplace soars just as high, and the vast array of windows invite the outdoors in. The two main floor bedrooms are quietly tucked away, as is the main floor laundry and mud room. The upper level is host to three more bedrooms, each with a private ensuite. The master bedroom offers a spacious dressing room and a luxurious 5-piece ensuite with heated floors and two separate vanities. This level overlooks the great room and is illuminated by a skylight. 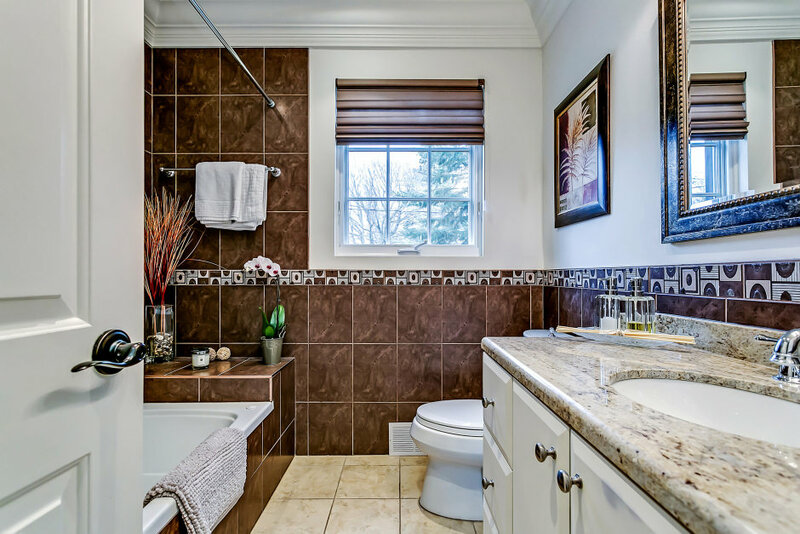 With recently upgraded travertine tiled flooring throughout, the lower level is packed with something for every member of the family… and then some. 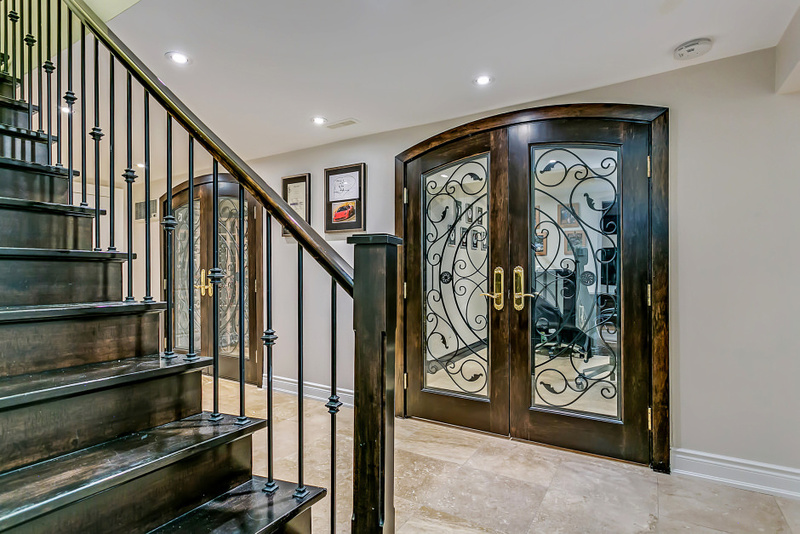 The wine cellar and office are each elegantly presented through impressive French doors. The lower family room includes a wet bar with two Fisher & Paykel DishDrawers. The sprawling entertainment room is host to a games area, home theatre and exercise area. A sixth bedroom and full bathroom complete the space. Now let’s talk about the outdoors. Wow. The vast majority of the ample features in the woodsy and sprawling backyard are newer or recently refurbished. The covered terrace, enveloped in glass balustrade, offers a hot tub, gas fireplace and built-in patio heating lamps. The gunite pool is refurbished, with newer hardscaping. The covered, outdoor kitchen will blow your mind. It’s loaded with Fisher & Paykel appliances, including a built-in barbecue, bar fridge & ice maker, plus a Big Green Egg smoker oven/grill, and a pizza oven. All beautifully finished with granite counter tops, a striking light fixture, and a gas fire feature next to the alfresco dining area. Greenhouse and garden shed. Easy access to Oakville’s renowned independent schools, as well as to the QEW and GO Station for a short commute to Toronto.